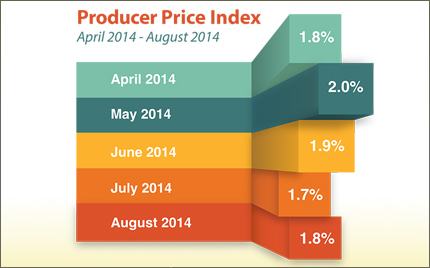 Last Week in Review: The Fed met, plus key housing and inflation reports were released. Forecast for the Week: The first half of the week features important housing reports, while the second half includes key news on the U.S. economy. View: Time is money. Make your meetings count with these tips. "Good communication is as stimulating as black coffee...and just as hard to sleep after." Anne Morrow Lindbergh. There was plenty of communication from the Fed to stimulate the markets last week. Learn the highlights—and the impact on home loan rates. The Fed pulled no punches after its regularly scheduled meeting of the Federal Open Market Committee, once again tapering its big Bond-purchase program. The Fed will now purchase $5 billion in Mortgage Backed Securities and $10 billion in Treasury securities each month, which is down from the $85 billion in purchases the Fed was making each month when the program first began. The Fed is expected to fully wind down the program at the end of October, and the question remains: How will home loan rates, which are tied to Mortgage Bonds, be impacted? In housing news, the National Association of Home Builders reported that its Housing Market Index rose by four points in September to 59, its highest level since November 2005. The index measures home builder confidence in the newly built single home sector of the market, so this is a good sign for the housing industry. However, on a disappointing note, both Housing Starts and Building Permits declined in August from the previous month.Also of importance—inflation at both the wholesale and consumer levels remains tame, as evidenced by the Producer Price Index and Consumer Price Index, respectively. This news is friendly to Bonds (and also to home loan rates), as inflation reduces the value of fixed investments like Bonds and any hint of inflation can cause Bonds and home loan rates to worsen. Look for key housing reports, plus an important update on U.S. economic growth. Housing numbers kick off the week with Existing Home Sales for August on Monday. New Home Sales for August follow on Wednesday. As usual, Weekly Initial Jobless Claims will be released on Thursday, along with Durable Goods Orders. The big news of the week comes Friday with the final reading on Q2 Gross Domestic Product. The Consumer Sentiment Index will also be released on Friday. As you can see in the chart below, Mortgage Bonds were able to stabilize in recent days. 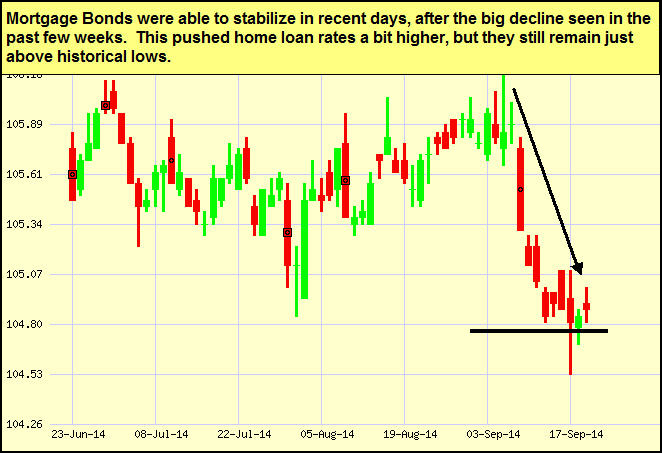 Home loan rates remain near historical lows and I'll continue to monitor them closely. In business, time is money. Whether meeting one-on-one with clients or with a team, follow these tips to stay on task and make the minutes count. Define an objective. Your objective is your reason for getting together. If you don't have an objective, don't meet. Objectives might include brainstorming, presenting options, developing plans, providing status updates, or finalizing a decision. Distribute an agenda in advance. Include date, time and location of the meeting (or call-in and log-in information, if applicable). Specify the meeting objective(s). Clearly state who is responsible for leading a topic, as well as any work to prepare for the meeting. Begin and end on time. Be respectful of everyone's time and stick to the schedule. Make sure you factor in ample travel time to and from meetings (whether across town or across the office). If one meeting ends right before another begins, your schedule may get thrown off track. Stay focused on the discussion at hand. Good discussions often yield more good ideas and questions; however, these can quickly derail a meeting. Keep a separate document handy to jot down future agenda topics, so you stay focused on the meeting at hand. Define next steps. Assign individuals to specific tasks, define deliverables, and set timelines for completion. Summarize. To help ensure all meeting attendees are clear about meeting outcomes, summarize the key points and next steps. Distribute meeting minutes. Meeting minutes serve as a historical record, as well as a summary for those who were unable to attend. Minutes include date, time, list of attendees, key points, decisions and next steps. Distribute minutes within 48 hours of a meeting. For one-on-one client meetings, a follow-up email serves as meeting minutes. Following these tips will help ensure time being spent is worthwhile for all involved. As always, please feel free to pass these tips along to your team, colleagues and clients!